CU-Structural Soil® is a major innovation in urban tree planting technology, which creates a porous, oxygen-filled root zone, while still maintaining the structural durability to support concrete, asphalt, or other hard surfaces for roadways, parking lots, sidewalks and more. Since 1999, TMT Enterprises, Inc. has been Northern California’s licensed producer of Cornell University’s patented CU-Structural Soil®. Also known as CU-Soil®, this revolutionary product provides a greatly improved growing environment for street trees, parking islands, median islands and more. 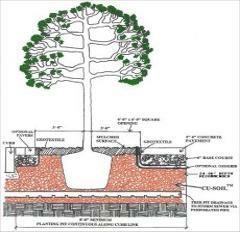 A typical cross-section for street trees utilizing Cornell University's CU-Structural Soil®. Conventional tree wells are nothing more than containers set into the ground. Tree roots are restricted to this confined area surrounded by densely compacted soils. With very little oxygen, moisture and nutrients available, the roots often grow into the weakest available fissures and seams, which is usually the interface area between the compacted base and sub-soil or paving surface. It's this process that causes the heaving and fractures we see in sidewalks, roadways and parking lots every day. These cracks, lips and undulations have become a huge liability for cities as they are responsible for a large volume of trip and fall injuries every year. Besides the safety issue, the conventional tree pit and it’s confined growing environment are responsible for the premature death of many of our street trees. Cities incur the additional costs of removal and replacement in one half or even one third of the tree’s normal life span. CU-Soil® provides trees with a vast, oxygen-filled root zone, deep beneath sidewalks, parking lots and roadways. These trees grow faster, develop thicker canopies and live longer. They provide more shade, more cooling of heat islands, more noise reduction, air and water filtration and many more measurable benefits to our cities and residents. TMT Enterprises, Inc. has supplied more than 150 successful installations of CU-Soil®. Call us today to find out more about how this fantastic material can benefit your project.